Your Personal Weight Gain Chart Can Show You What Kind of Eater You Are! Filling out a Weight Gain chart is a healthy diet habit! Each one of you has a different weight history. Understanding your weight history can show how you use food to cope with life. There are those of you that overeat a bit each day, and your weight gain is slow and consistent. You probably have unhealthy diet habits. It would benefit you to go to the Food Habits section and concentrate on this area! There are those of you who eat when life is difficult. Your weight gain will increase during hard times. You will benefit by looking at the emotional eating section and stress section and working through these areas of difficulty! By plotting your weight from age twenty on, in 5 year increments, you should be able to see how you cope with food in your life! 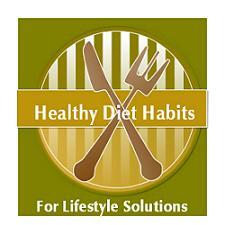 Are you an emotional eater, a stress eater, or do you just have consistent unhealthy diet habits? Specific knowledge that you glean about yourself can help you develop new patterns of eating for your specific problem areas! 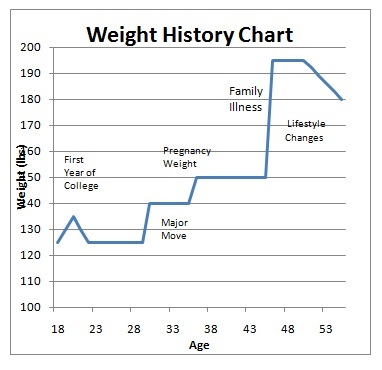 Here is what you might expect to see on a sample weight gain chart. This person gained 10 pounds in college, but later lost it. She added 15 extra pounds at the birth of her last child that she did not lose (very common). She added 10 extra pounds during a major move to a new state due to loneliness! She gained 45 pounds due to a family illness. She gained weight each time life was extremely hard, and over the course of her life, put on 70 pounds related to life’s difficulties. She eats fairly healthy, a little too many carbohydrates, but needs to work on emotional eating and how to handle stress! She recently added swimming to her life and lost ten pounds! Developing lifestyle solutions that work for your history is helpful because you are all unique!